Fine and dry powder snow, A+ service quality, incomparable cuisine, relaxing hot springs, beautiful landscape. It all sounds like a dream vacation, but you can find all of these for real on a ski trip to Japan! Skiing or snowboarding in Japan is a unique experience, wherever you go. But to get the most from your time here, it’s worth spending a little time planning your trip. Skiing and snowboarding instructor Lorraine Lam, founder of SnowboardHow.com, shares her invaluable insight from nearly a decade on the slopes in Japan. So here are her top tips for 10 things to consider when you’re planning a skiing trip to Japan. You can also combine skiing with enjoying the stunning sights of a snow-covered Japan. Check out these 10 Best Towns to Enjoy the Winter Snow in Japan for some recommended spots! 1. Where’s the best place to go skiing in Japan? 2. When is the ski season in Japan? 4. What accommodation should you choose? 5. What ski equipment to bring or rent? 6. How to get to Japanese ski resorts? 7. What to do with your luggage when traveling? 8. Can you visit onsen hot springs with tattoos? 10. What about eating out? Being a mountainous country, there are ski resorts all over Japan. Most of them are concentrated in Hokkaido, Nagano, Niigate, and the North-East. To make it easier to decide where to go as a foreign visitor, you might want to bear in mind a few different factors such as the convenience of travel, the popularity of English, the overall facilities and the scale of the resort area. Niseko is the largest ski resort area in Hokkaido, very easy to access (with direct bus services from Sapporo airport and city), English is widely spoken here, and there is a great nightlife in neighboring Hirafu, with loads of amazing accommodation. There are plenty of other attractions too: check out the Best Things to Do in Niseko When You’re Not Skiing! Rusutsu is the second largest Hokkaido ski resort, also with direct bus links from the airport and city, with many hotels and facilities. It’s a very family friendly hotel but with limited nightlife. It is close to Niseko, so snow quality is always great. Furano is a smaller resort when compared to Niseko and Rusutsu, but it is still a large scale for Japan. It’s very easy to go to the nearby town of Furano, and is also a very family friendly location! Very light, dry powder snow. Club Med Tomamu and Sahoro is also on a similar scale, but as it is Club Med, there’s no need to worry about lessons, popularity of English, arranging meals, etc. As with elsewhere in Hokkaido, the snow is of great quality! In fact, the snow quality in Hokkaido is probably the best in Japan, and in some parts of the island you can find nice powder snow falling as late as April. All the resorts in Hokkaido can be considered suitable for all levels. Although the slopes are not as challenging as those on the main island of Honshu, you can still have loads of fun on the high-quality powder snow. In Nagano there are plenty of ski resorts suitable for all levels, such as Hakuba, Nozawa, and Shiga Kogen. Snowboarders can enjoy these too, although Shiga Kogen is perhaps more on the skiing side. There’s plenty to do in Nagano off piste as well. Check out 7 Best Things to Do in Hakuba When You’re Not Skiing for some top tips! For beginners and intermediate riders, Karuizawa is an excellent choice. It’s a smaller area compared to some of the others, but a great location (right next to the train station), only 90 mins away from central Tokyo. It’s also a good option if you’re looking to get in some shopping while you’re there. There’s not as much powder snow here as in Hokkaido for example, but, being so close to Tokyo makes it a top destination. Neaba is suitable for all levels, while Gala Yuzawa is most suitable for beginner to intermediate riders. It is pretty similar to Karuizawa in its easy access to Tokyo. There’s no shopping mall, but the wonderful onsen there more than make up for it! The snow season of Nagano and Niigata may be shorter than Hokkaido but the mountains are more interesting. And although the snow quality of Hokkaido is superior, the snow in Nagano and Niigata more than holds its own against European resorts. In the North East area, there are plenty of ski resorts all levels of skiers and snowboarders, such as Appi Kogen, Zao Onsen and Hokkada. For advanced riders Hokkada also has opportunities to explore the spectacular back-country. However, English is not that widely spoken in the North-East area, and the resorts are a little harder to get to. On the other hand, they can easily compete with the top quality powder snow of Hokkaido, and the breathtaking beauty of the Japanese Alps. If you’re looking for the more traditional Japanese experience you can find very nice and reasonable sake in the Zao Onsen area too! 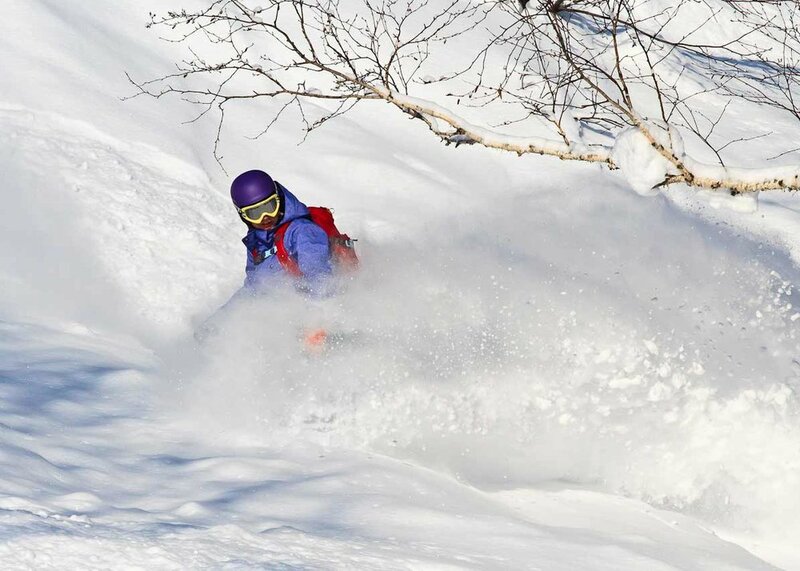 These resorts are recommended for those riders with some Japan skiing experience. 2. When is the the ski season in Japan? The typical Japan ski season is from early December to late April for resorts on the main island of Honshu, and early May in Hokkaido. Most terrains are opened from mid-December to early April. However, If you are looking for the best skiing in Japan (fresh, dry and fine powder snow everyday) then the best time for your Japan skiing trip would be from late December to late February. Skiing in Japan is not so expensive; it’s actually quite cheap compared to Australia and New Zealand for example. However, it’s always good to save money where you can. Book early! You can save over 30% with an early bird ticket. There are also some great Japan skiing packages out there, so shop around. Ask your accommodation or resort shuttle bus for a package discount. Make good use of JR Rail Pass if you would like to get in some while you’re in Japan. A Japanese style family room is big enough to accommodate a family of four or five. Booking an apartment with built-in kitchen could save you a lot on dining expenses. If you are a family or a larger group, it may be cheaper to drive instead of taking public transport. Don’t forget your International Driving Permit: you won’t be able to rent a car in Japan without it. What are the best choices for accommodation? What type of hotel should you pick? Here are some useful tips to help you out. If you have never stayed in a Japanese style tatami room before, you might consider picking an accommodation with beds as opposed to futons. You’ll obviously be pretty tired after riding all day, and if you’re not used to futons, beds might be a bit more comfortable. Alternatively, you can always ask to double up your futon mattress if you’re finding it a little hard. Ski in ski out is always the best choice, but you can also just give the hotel a call to check if there are any shuttle bus services. For example, Hthe irafu area of Niseko has shuttle bus services running around the little town from 8am till 9pm. If you are traveling with kids, it is a good idea for you to pick somewhere with a built-in kitchen so you can cook for them. Niseko has a lot of this type of service apartments. Alternatively, a hotel with loads of free snacks, or long meal-serving hours are usually helpful for families. It’s also a good idea to choose a hotel with loads of facilities inside, so when the weather is not that nice or you just decided to take a break, there’s something to keep the kids entertained. If you can, it’s always best to bring your own set, because we all love to use our own board! However it’s very easy to rent all the clothing and equipment you need at most of the resorts, so don’t worry if you don’t have any of your own. In Japan, you can reach most ski resorts by public transport. From Tokyo you can get to the resorts on Honshu by train, bus, or a combination of the two for more out-of-the-way places. If you are planning to go to Hokkaido, the best option would be to fly as it’s fast, easy and cheap. You can take the train from Tokyo too if you already have an all-access JR pass, or you’re just a mad lover of trains! If you’re flying in from (or via) several Asian cities such as Singapore, Bangkok, or Hong Kong, then you’ll save time and money by flying directly to Sapporo Chitose Airport. Once you have landed and left the customs, pack everything you don’t need for sightseeing into your ski bag. Go to the courier counter and have it sent to your ski holiday accommodation. Shoulder your lightweight luggage and enjoy Japan! If you plan to go sightseeing after your ski holiday, just pack and send your luggage directly to the airport as the courier can store your luggage for a short period of time for free! Japanese onsen are probably one of the top reasons that keep people coming back to Japan for skiing. It’s so relaxing to dip into the hot spring bath after a long day skiing. These days some onsen are beginning to accept guest with tattoos, although certainly not all, so it is always a good idea for you to check with the accommodation or the tourist organization if there is any hot spirings in the vicinity accepting inked people. If you’re in the Tokyo area, check out this article for some suggestions! Make sure you ollow and respect the onsen rules. In particular, make sure you don’t drink then go to onsen with an empty stomach! One of the best things about snowboarding and skiing in Japan and is the price! For example, the Niseko all mountain pass would cost you only ¥4200 yen (around $40) per day. And for ski rental you could expect to pay around ¥4500 - ¥6500 yen ($40 - $60) per day. Just remember that it’s always a good idea to book early if you are going to those popular ski resorts like Niseko. You can ask your accommodation for the rental information. Japanese food is… amazing, and dining out doesn’t have to be expensive. If you prefer to grab your dinner in a restaurant, a ramen shop would offer the cheapest meal set. Most of the time you can get a steaming bowl of thick delicious soupy noodles for around ¥1000, or $9. Or else just pick somewhere offering a meal set, which is very common at lunch time. You can expect to pay around ¥1000 - ¥2500 ($9-$20) per head if you are not ordering alcohol. And you won’t be expected to leave a gratuity - unless you see a sign that the shop welcomes tips. Lorraine Lam, the founder of SnowboardHow.com, is a passionate ski and snowboarding instructor from Hong Kong. She spent most of her winters teaching in ski resorts in Japan, Europe, Canada and China. She spent lots of time teaching in the largest indoor ski resort in Harbin, and is planning to start a ski school in the upcoming indoor ski resort in Guangzhou.